Romantic Vacations in the USA are sometimes what the doctor ordered. Whether you live in the United States or Canada, or you are visiting from around the world there are a lot of romantic options in the USA. Choose Las Vegas, the Central Coast of California, Take a Napa Valley Wine Tour, San Francisco, New York City, Boston or Florida. Living in Toronto, we have many options for taking a quick trip away in North America. When our lives get hectic or we need a break, we break out our frequent flyer miles and take a last minute getaway to some of the best cities in the world. Or if we want to reconnect and spend some time alone then we choose a closer destination or small town to reconnect. 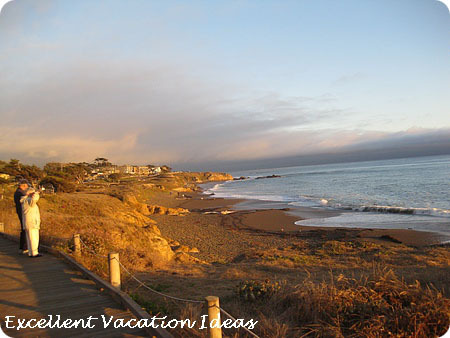 We LOVED the central coast in California (Cambria) and had a lovely couple of days at the Blue Dolphin Inn. 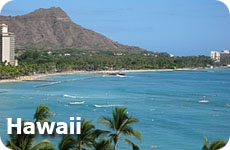 Try to think of ideas for romantic vacations in USA close to where you live. You might say Las Vegas Trips aren't Romantic? They sure are! Why do you think so many couples get married there? We love Las Vegas and try to get there at least once, sometimes twice, a year for a 4 day trip. We love the restaurants, hotels, pools, shopping, entertainment, and casinos. We love it all and have been going there for more than 11 years together! 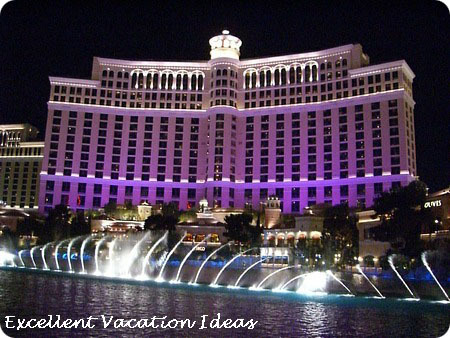 We love watching the Bellagio fountains together, or trying out new restaurants. Even if you don't like to gamble, there are so many romantic things to do there. We keep Las Vegas in the "adult vacations" category, as it is much more fun if you are over 21! Having said that, we have taken Montana to Las Vegas to see a concert she really wanted to see. She loved it, but we were all restricted by what we can do since she was underage. New York, Chicago, Los Angeles, Toronto, Calgary, Vancouver, Montreal, San Francisco - They all have their charm and are great for short weekend getaways. Boston is one of our favorite weekend getaways. The charming neighborhoods, history, Faneuil Hall Marketplace and amazing restaurants. We have stayed both in Boston, gone to Cape Cod and Marblehead (this was our favorite). For some great romantic things to do in Boston, check out our guest post from Boston Tourism Made Easy. A weekend in the Windsor Casino, and Detroit area can be a great mini break or discover how Romantic Lake Michigan can be - Travel along Michigan's majestic west coast. Visit sleepy little beach towns and "Tuscan style" wineries. Don't forget Florida! Check out our Florida Vacation Guide, for inspiration for a romantic getaway. Foxwood Resort and Casino is a great weekend romantic vacation idea with amazing restaurants, great concerts and of course the Casino! Get your free eBook and learn the secrets on how to choose a family holiday that everyone will enjoy! 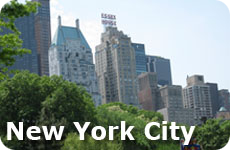 Beautiful hotels, some of the worlds best restaurants, incredible shopping, central park and of course Broadway. What could be more romantic for a weekend away? Ah the city of romance, or the city of lights. 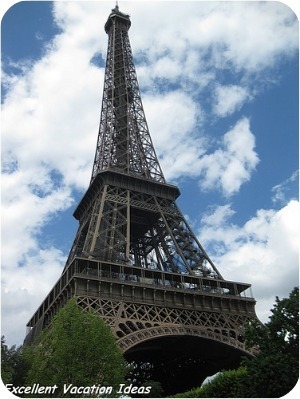 Regardless, all you have to say is Paris and think of romance.